Bajra Sandi Monument is located in the city of Denpasar which is a monument to the Struggle of the Balinese People and became a heroic symbol of the Balinese people from generation to generation also from ancient times to the colonial era. This monument stands upright on a green expanse of grass and is very beautiful to be able to see it. 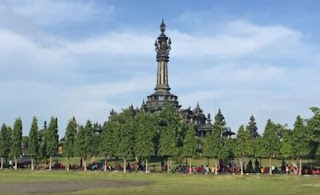 Visiting this monument, you will see typical Balinese architecture where the Bajra Sandhi Monument expresses a tall bell looming in lotus (seroja), the symbol of the meeting of lingga and yoni, namely the nature of masculinity and femininity, having meaning to give birth to fertility and prosperity, thus creating welfare of the people. This building applies the Tri Mandala conception. Entering the monument, from the bottom you have to climb the stairs that will take you to a park, then there are a few more stairs to go inside where there is a fish pond in it. Then head to several other steps to get to the main room where you can see various dioramas that tell the story of life in Bali from the stone age to the era of independence. Banjra Sandhi has space at the top where there are only access stairs in the middle of the pool. From the room, you can see the green grass field, roof of the house, and surrounding buildings dominating the scenery. The unique design of Bajra Sandhi attracts many visitors every day, and art exhibitions such as photos or painting competitions often take place in the exhibition room. There are even more beautiful views outside the diorama space, where you can enjoy the view while enjoying the blowing wind.